» A Movie Review by Dan Stumpf: VIOLENT SATURDAY (1955). A Movie Review by Dan Stumpf: VIOLENT SATURDAY (1955). VIOLENT SATURDAY. 20th Century Fox, 1955. Victor Mature, Richard Egan, Stephen McNally, Virginia Leith, Tommy Noonan, Lee Marvin, Margaret Hayes, J. Carrol Naish, Sylvia Sidney, Ernest Borgnine. Based on the novel by William L. Heath. Director: Richard Fleischer. It took me a long time to catch up with Violent Saturday, which I saw on local TV in the 60s, pretty badly cut up. At the time I thought it a compact little gem of a film, but seeing it again recently at last, I find it’s the kind of film that needs to be badly cut up. There’s a fine little Heist Movie at the heart of it, and when three exemplary Heavies like Stephen McNally, J. Carroll Naish and Lee Marvin finally square off against Victor Mature, the film snaps, crackles and pops with excitement. Unfortunately, it takes about eighty minutes of Nothing Very Much to get around to it. I recommend the book, by the way, a nifty little novel by W. L. Heath (Harper, 1955; reprinted by Black Lizard, 1985) that brings life to small-town characters reduced to Soap Opera status in the film. Violent Saturday is a weird mix of two kinds of films. One kind is the film noir crime thriller. The other kind is what used to be called “Soap Opera”, and which has been politely renamed “melodrama”. Melodramas look at people’s personal lives, relationships, families, emotions and problems. Quite a few were made in the 1950’s, especially by directors Douglas Sirk, Vincente Minnelli and Delmer Daves. 1950’s melodramas tend to be in rich color. 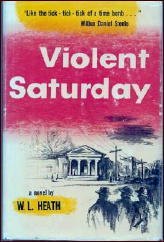 The spectacular color design of Violent Saturday is typical of melodrama. It is rare in film noir, which usually is in black and white (the thrillers Slightly Scarlet and A Kiss Before Dying are famous exceptions). Thanks for the link. I haven’t had time to check out everything the site has to offer, but I will, as soon as I can. Mike, Comment #1. The first thing I noticed when I posted that video was that the movie was in color. From Dan’s review, I hadn’t expected that at all. Not only is the movie in color, it was also filmed in CinemaScope. Not many noir films can claim that, even if VIOLENT SATURDAY is only partially noir. Mike, Comment #2. Back when I was in college, I could only dream of watching movies and getting credit for it.